* Abbamare – Sardinia; a semi-soft cheese made from a mixture of cows’ and sheep’s milk. * Acceglio – from Piedmont; a fresh cows’ milk cheese made in the area of Acceglio (province of Cuneo). * Ainuzzi – Sicily; a cows’ milk cheese made in Cammarata and San Giovanni Gemini (Province of Agrigento). * Algunder Bauernkäse Halbfett (Italian formaggio contadino semigrasso di Lagundo) – from Burggrafenamt (Italian Burgraviato), South Tyrol. * Algunder Butterkäse (Italian formaggio di Lagundo) – from Burggrafenamt (Italian Burgraviato), South Tyrol. * Aostano – Val d’Aosta; cows’ milk. * Aostino – Val d’Aosta; cows’ milk. * Aschbacher Magerkäse (Italian formaggio Aschbach magro) – South Tyrol, from Burggrafenamt (Italian Burgraviato),. …and that’s just the list of Italian cheeses starting with “A”!! Join Peter Dixon from Dairy Foods Consulting in Westminster, VT to learn about your favorite Italian Cheeses at this two day Maine Cheese Guild sponsored workshop held in Rockport, Maine held the weekend of May 14th and 15th. And when we say, “your favorite Italian Cheeses” we MEAN it! 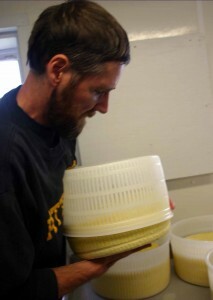 The participants can help determine which types of cheeses Peter will focus on. Please add your suggestions to this article by posting a comment. ***This workshop has now been filled. *** All participants will need to submit the balance of the workshop fee upon arrival. Posted in Events, Guild, Learning and tagged Italian cheese, Peter Dixon, workshop. I’d like to sign up for both workshops.